You can select a caller’s information to be displayed when you have an incoming call. - Repeat the procedure to select Caller ID Info. 3. Rotate to select a mode you want, then press . 4. You will receive a notification on the screen if the change is successful. Name Priority mode: A caller’s name is displayed if it is stored in the phonebook. 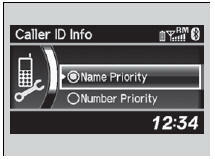 Number Priority mode: A caller’s phone number is displayed.